The FLEXPOINT MVstereo laser module from LASER COMPONENTS is now also available with truly random patterns with 31,806 or 47,708 dots. These patterns are generated completely randomly; even in partial patterns, repetitions do not occur. The range of pseudo random patterns has also been expanded: Versions with 40,100 and 29,594 dots are now also available. Due to the different number of dots and the different fan angles of the patterns, the customer can choose the optimal optics for his application. 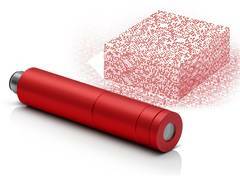 Both versions are available with red (660 nm) or NIR (830 nm) lasers, and both are eye safe (laser class 1 and 1M). The FLEXPOINT MVstereo was specially developed for 3D stereo image processing, in which three-dimensional structures are calculated from the pixel information. One basic prerequisite for this method is that all the pixels of the two camera images be able to be clearly assigned during image comparison. However, this is only possible on unambiguously textured surfaces. For smooth, monochrome structures, either markers or random patterns are used. The pattern generator of the MVstereo projects a randomly-arranged cloud of dots. Each dot can be assigned to a specific position.